I recently reread the Austenland duology, which put me in the spirit for some of the real thing. I’ve reread a fair amount of Jane Austen in the not too distant past, but it had been a long time for Persuasion, so I decided to listen to the audiobook. Persuasion follows the story of Anne Elliot, who is seven-and-twenty and unmarried (horror!) In her youth, she loved a sailor, Captain Wentworth, but was persuaded it was an unwise match. She gave him up, but misses him still. Now he’s back in England, a wealthy and successful man, but seems quite cold to her when they begin to move in the same social circles. This is the main plot thread, but Persuasion is full of family dramas involving Anne’s two rather unlikable sisters, foolish father, and host of in-laws. This book is so very Austen, in that for whole stretches not a great deal happens besides going for walks and having intensive debates about relative ranks in social circles. It’s an interesting social study, and the soothing kind of book where you know nothing very bad is going to happen–despite a life-threatening injury to one character, and financial crises of others. Anne is a bit of a puzzle to me. She’s unfailingly kind and sensible, with a genius for putting up with other people’s foibles and still liking them (in the case of her sisters, for example). She’s not as witty as Elizabeth Bennet, but also not quite so self-effacing as Fanny Price (who I actually like, though I believe I’m a minority!) I got frustrated with her at times though, I think because I brought modern sensibilities to a very different social setting. Anne encounters Captain Wentworth–misses him–wonders how he feels about her–and does nothing! But I imagine there was nothing much for a well-bred young lady of the time to do, and perhaps Austen’s original readers would have taken that for granted. The book picked up for me as it went, as Austen wove in more and more characters and threads around them, as more matches were made or attempted, and Anne and Captain Wentworth eventually…but that would be a spoiler, wouldn’t it? The funniest bit of the book for me was, I think, unintentional on Austen’s part. Anne has a dear friend who has fallen in her fortunes, widowed, destitute and ill, and forced to rent two small rooms–without even the comfort of a servant! If she had said nurse it would have felt more reasonable, but she distinctly said servant. I can sort of see why Charlotte Bronte felt her heroines started where Austen’s heroines feared to end up. 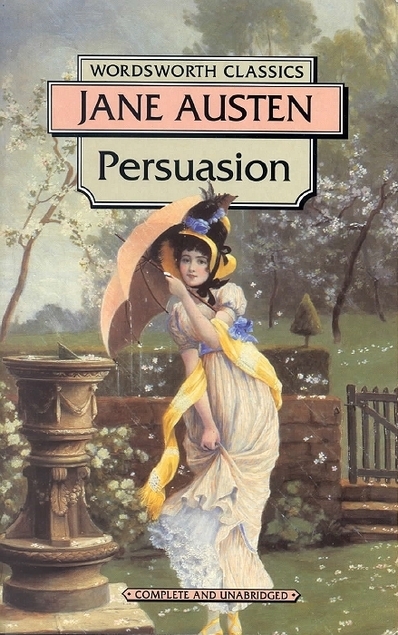 Northanger Abbey remains my favorite Austen, and Emma is among the most relaxing books I’ve ever read, but Persuasion has its good points and I enjoyed reading it again. Something that struck me most was the brief author bio at the beginning. I don’t think I realized that Austen wrote most of her books in the last few years of her life, before her death in her early forties. How many more books, how many more heroines, might we be discussing if Austen had lived even ten more years? Fascinating mysteries of history! Perhaps in some other, parallel universe, Austen wrote a dozen books. I’d like to think so! Funny how readers can’t help but bring their own modern sensibilities to stories and novels written in a different time. With the role of women and society itself changing in directions unheard of at the time these books were written, it’s challenging for modern readers to put themselves in the mindset of the characters and understand fully their motivations and actions.